In honor of Joel taking a trip back over to India we wanted to search for more Indian inspired food. This one would work well for either a breakfast option or a lunch option. The prep work takes a little while but we think in the end you'll very much enjoy this recipe. Combine garlic and ginger in a bowl; press with spoon to make a paste. Heat oil in a large nonstick skillet over medium-high heat. Add onion, reduce heat to medium and cook , stirring, until softened, 3 to 4 minutes. Stir in turmeric; cook, stirring occasionally, until the onion is light brown, 5 to 7 minutes more. Stir in garlic-ginger paste, coriander, chill powder and salt. Stir in water, partially cover and cook until the water evaporates, about 5 minutes. Add eggs and cook, stirring constantly, until almost set, 4 to 6 minutes. 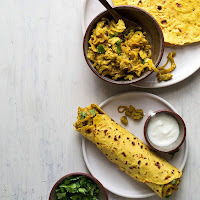 Serve rolled in paratha (or tortillas) with cilantro, if desired.